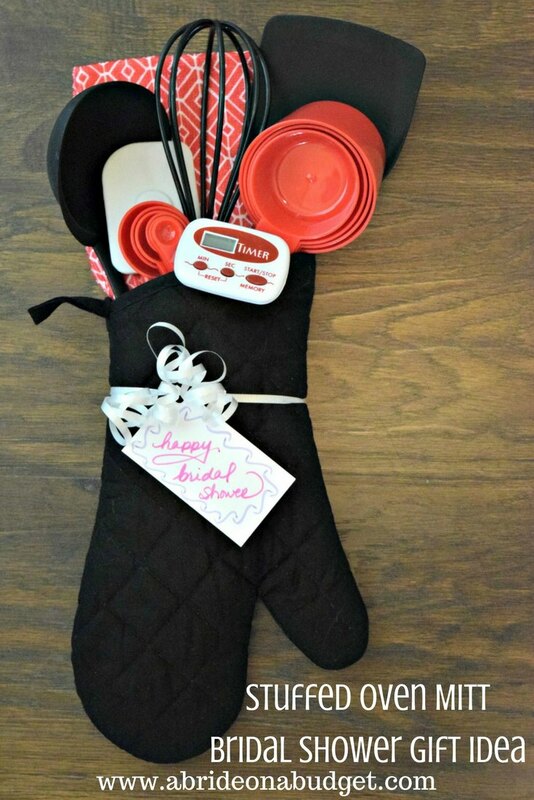 This Stuffed Oven Mitt Bridal Shower Gift Idea post was sponsored by Dollar Tree. 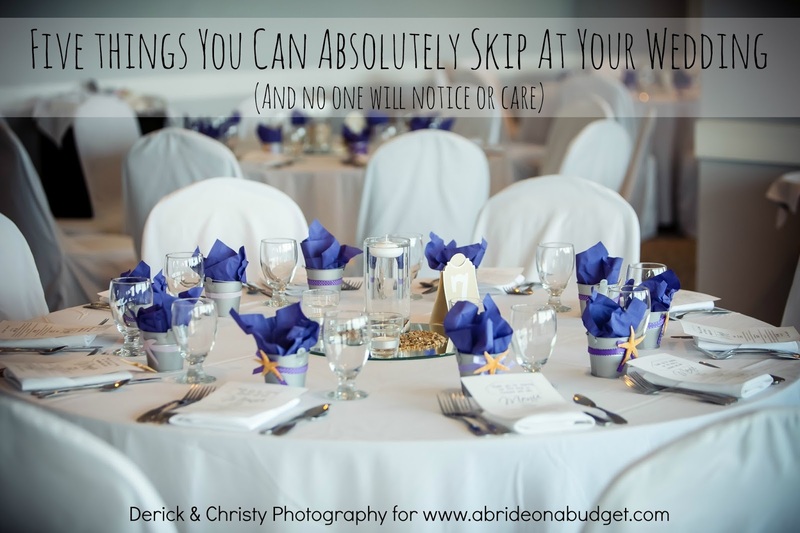 All thoughts and opinions belong to A Bride On A Budget. I'm a big fan of practical gifts. I want to give something useful, something a couple will use often. It's great that way. First of all, you're giving something they need rather than something that will sit and collect dust. Second, when your recipient uses those gifts, they'll think of you. And if you get a useful gift, they'll think of you often. If you agree, I have an incredible bridal shower kitchen gift idea for you. What's great about this gift idea is you can fill it with anything you like. 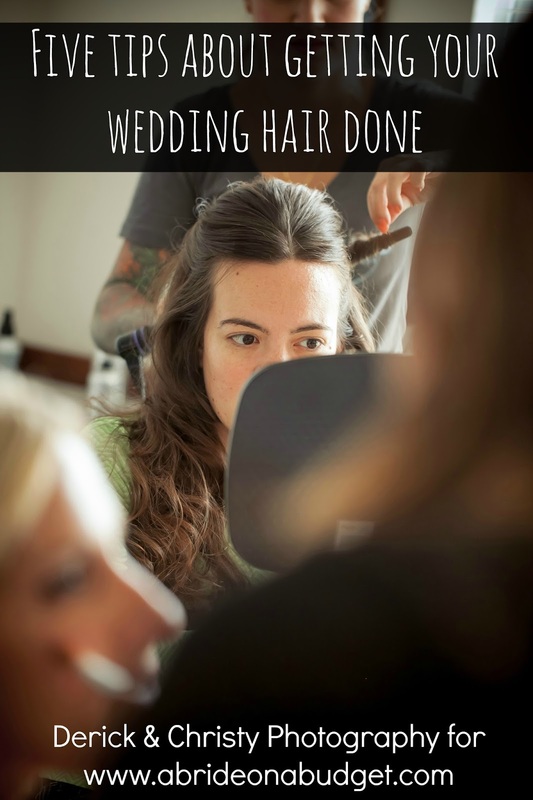 I picked the items that we use most often because I figured a new bride would use those as well. If your recipient loves to grill, you could swap some of these items for barbecue tongs and a basting brush. If she loves healthy eating, go with salad tongs and a lemon squeezer. You have so many possibilities, especially at Dollar Tree. There's a whole aisle dedicated to kitchen items, making this gift so easy to put together. Plus, everything is a great quality. I purchased some kitchen items at Dollar Tree when I moved out on my own twelve years ago and Pete and I are still using them. 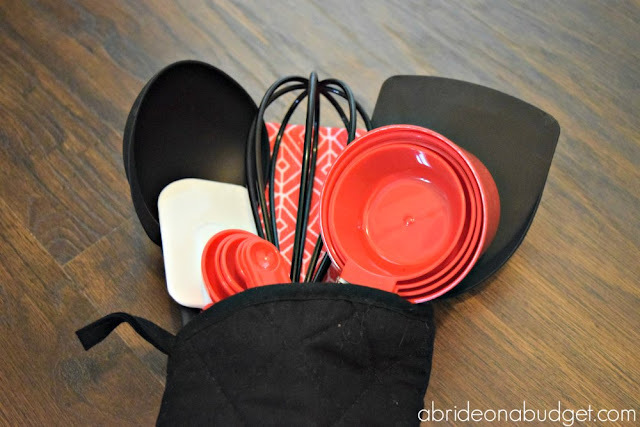 We've had a ton of kitchen utensils come and go, but the Dollar Tree ones have endured. Cut the tags off all the products. 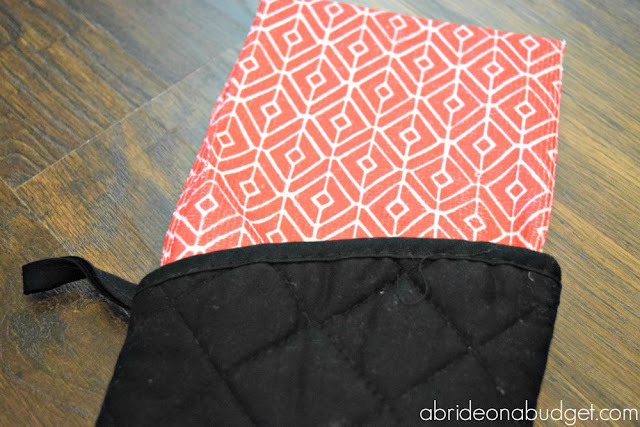 Refold the kitchen towel to make it a little smaller and stick it about halfway into the oven mitt. The towel will act as a backdrop for the rest of the gift. 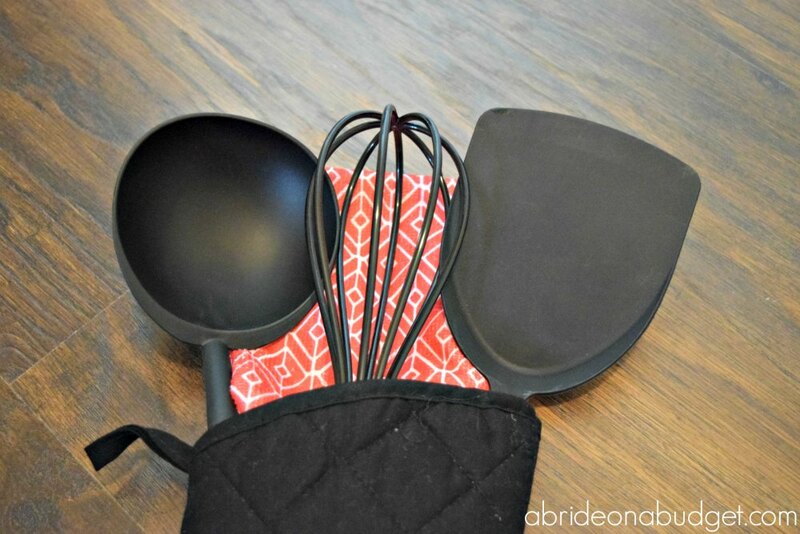 The back row is going to be your taller kitchen utensils, so in our case, the ladle, whisk,and turner. Put those in the pot holder first. Then, work on the front row. I used a spatula, measuring cups, and measuring spoons for this row. As with the back row, put those in the pot holder. 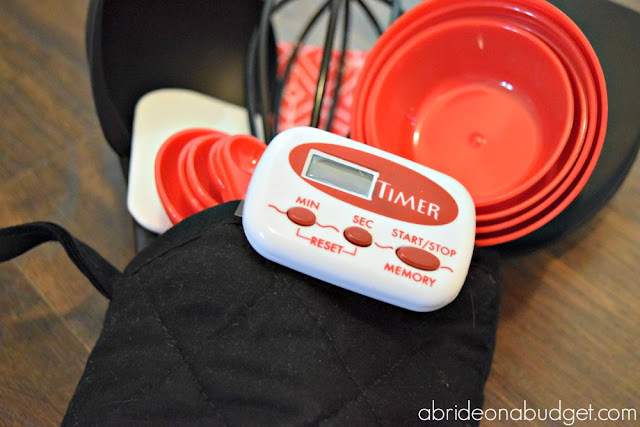 Finally, clip the kitchen timer to the pot holder. You can then tie a small card to the front with ribbon. Or you can put this in a gift bag you can find at Dollar Tree, then sign the card that is usually attached to the bag. 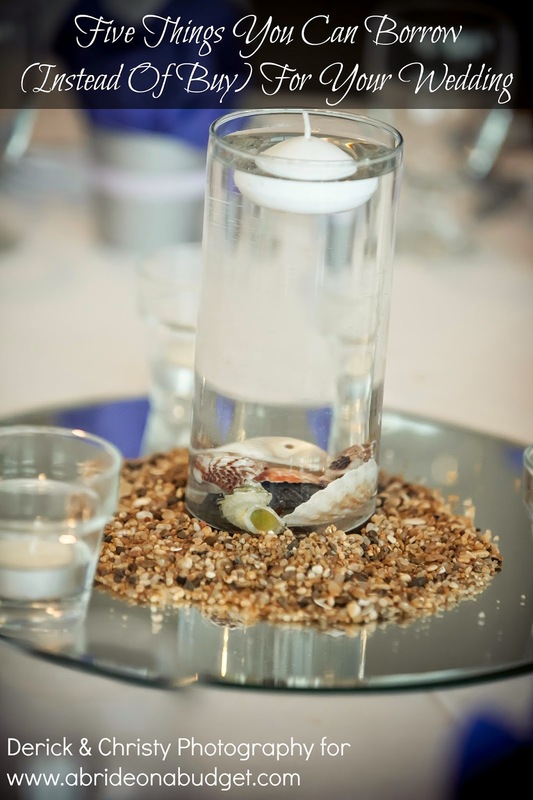 And great timing for this idea too. Through Wednesday, April 19, you can get $4.95 flat rate shipping on any purchase at Dollar Tree. You can pick up all the items for this gift, plus anything else you need for your bride, and have it all shipped for under $5. BRIDAL BABBLE: What kitchen utensils would you stuff into this oven mitt bridal shower gift? 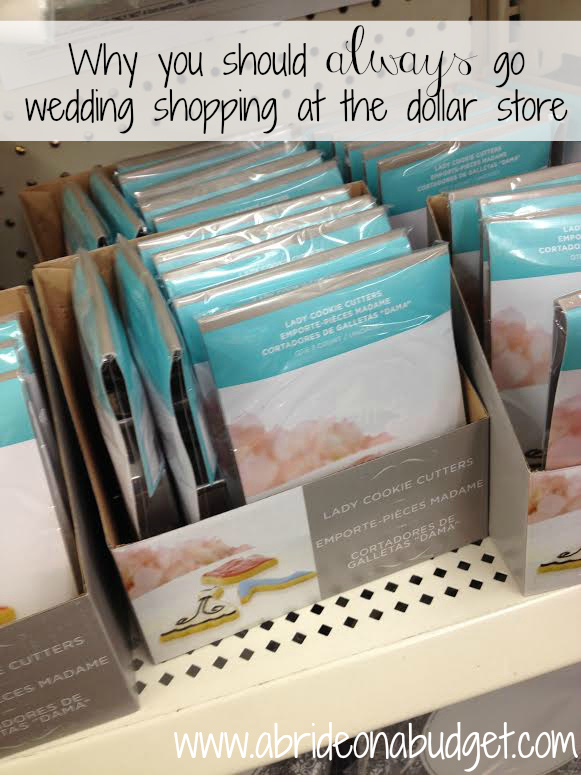 Want more Dollar Tree wedding ideas? What a cute idea! Love that it is all items that will be used again and again. I love Dollar Tree Kitchen utensils!!! They are some of the most sturdy I have gotten before, and they hold up to cooking with kids too! I love this gift idea, I prefer to give practical gifts like this. 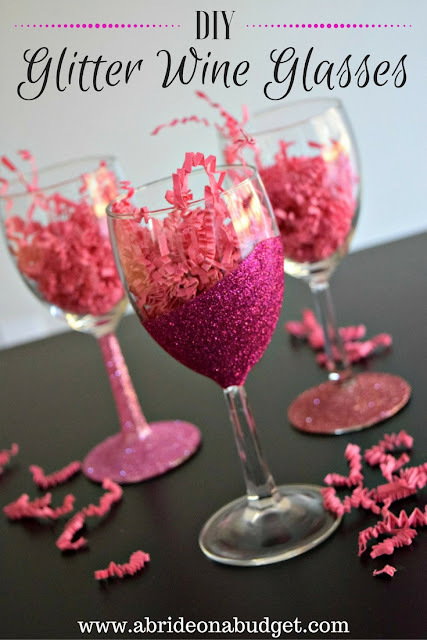 What an adorable idea for a bridal shower gift. It even looks great. This is such a great idea!! When you move into your first place, the first thing you think of buying is the big ticket items like furniture and post and pans. Then you realize that you don't have a few necessary (but small) kitchen items that are equally as important! 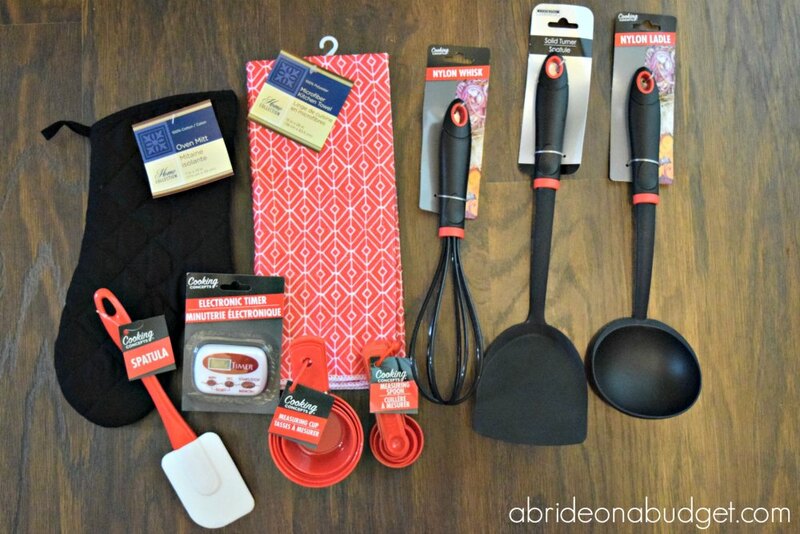 (CAN OPENER and OVEN MITTS) The Dollar Store is great for picking up all the essentials that you may have forgotten about and what a great gift! Love this cute idea, and the fact that everything in the glove is useful! Thank you for sharing at Celebrate It!